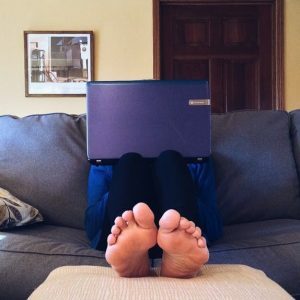 Is the NCRA Legislative Boot Camp for me too? You bet! You’ve heard about the great things that the NCRA Legislative Boot Camp has done for the profession. You’ve read the articles, seen the pictures, and heard the testimonials from your fellow court reporters and captioners on the incredible experience that Boot Camp has on attendees’ lives. But have you ever wondered: Is it only for state leaders? The answer is no for one simple reason: It is everyone’s job to protect the profession and each professional’s own ability to do his or her job. If you don’t commit to saving your job, who will? Boot Camp teaches everyone the issues affecting the profession at a national level and how to affect change at the state and local levels. People who have attended Boot Camp have used their new skills to advocate for things outside the court reporting profession, such as cancer funding, appropriations for local city needs, and more. Boot Camp has even so inspired former attendees to make changes in their community that they have run for political office. Boot Camp alumni have become city council members, aldermen, the assistant mayor, and even a state representative! What happens at Boot Camp? NCRA’s Government Relations team begins by training attendees on the basics of advocacy, including politics 101, grassroots lobbying, understanding the issues affecting reporters, and dealing with the press. Then attendees learn about a real-life scenario that is affecting court reporters. The attendees break into teams. The teams compete to come up with the best strategies and messages to influence mock senators in mock meetings. After their meetings, the teams testify in front of a mock Senate panel to try to influence a committee on a crucial issue. Testifying is challenging and forces attendees to think on their feet. Attendees take their charge very seriously and but also have fun competing to be crowned top team at Boot Camp for that year. Reporters can be very competitive! After two days of training, the attendees get a much-needed break to celebrate their efforts and bond with their fellow reporters. They also prepare for the next day, during which they will take all their skills and implement them for real. On Hill Day, attendees meet with their senators and Congressional representatives and pitch an issue critical to the profession to their national representatives and their staffs. The energy and excitement is palpable as the attendees arrive on Capitol Hill. The attendees meet with Hill staff all day, and finally their Boot Camp experience winds down with a great debrief at a Capitol Hill hotspot. Hundreds of reporters have gone through Boot Camp and become steadfast advocates for the profession. If you are interested in attending this life-changing event, please register at NCRA.org/BootCamp or contact NCRA Government Relations Manager Matthew Barusch with any additional questions. See how you can make a difference! It’s never too early to start planning how to celebrate the 2018 Court Reporting & Captioning Week, set for Feb. 10-17. NCRA has recently updated the event’s resource center on NCRA.org/Awareness and will continue to add new items designed to help members spotlight the profession. In addition, the 2018 resource center will include an updated, customizable PowerPoint presentation. The presentation is geared toward potential court reporting students and the public in general to help increase awareness about the ample opportunities available in the profession. 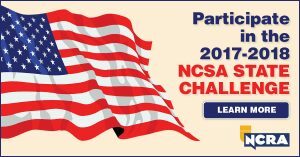 There are also quick links to NCRA’s DiscoverSteno site, which houses additional recruiting resources, and to information and submission forms for the fourth annual National Committee of State Associations (NCSA) challenge. The challenge is designed to encourage working professionals to reach out through career fairs and other activities to spread the word about what viable career paths court reporting and captioning are. The challenge will culminate during the 2018 Court Reporting & Captioning Week, and all entries will be eligible for prizes ranging from free webinars to event registrations. Members, states, and schools are encouraged to check the 2018 Court Reporting & Captioning Week resource center periodically, as additional updated and new items will be posted as they become available. The ways to celebrate 2018 Court Reporting & Captioning Week are unlimited. To learn more about how you can celebrate the week or to find the latest in resources, and see how others celebrated in 2017, visit the Resource Center on NCRA.org or contact the NCRA communications team at pr@ncra.org. And don’t forget to share with NCRA what you plan to do to celebrate. The A to Z Program offers participants the opportunity to learn the basics about court reporting in a six-to-eight week introduction to machine shorthand program. You can assist the next generation of court reporters and captioners. 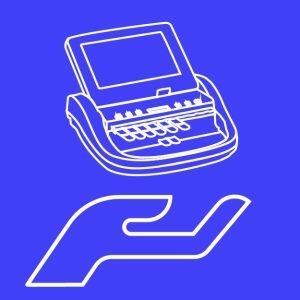 There is a great need for used steno machines, chargers, AC adapters, paper trays, ribbons, tripods, cases, etc. If you have these items, the A to Z Program is looking for donations and loans to programs in your state or local area. You do not need to ship your machine or any other items at this time. You will be contacted when your items are needed. We ask that everything you donate is in good working order and has been cleaned. This is an introduction to our profession, and we’d like the experience to be a positive one. Complete this form and NCRA’s Education Department will add your name and items to the database. When needed, you will be contacted by a local A to Z Program leader. Are you interested in leading an A to Z Program? A to Z Program leaders work with small groups of participants as they learn how to write the alphabet and numbers in steno. This program does not follow any particular theory. Program leaders receive free training materials after completing and submitting a program leader Memorandum of Understanding (MOU). For more information, view the A to Z webinar and read the frequently asked questions. An interview with NCRA member Kelly Moranz, CRI, program manager and adjunct faculty at Cuyahoga Community College, Parma, Ohio, about the growing demand in the captioning and court reporting profession was posted Oct. 1 by Smart Business.